This place should sound familiar because I hung out here with bff a few weeks ago (you can read about it here, along with the delicious deviled eggs peeking below). Part Tavern is a favorite because it’s close to my house, located in a cute neighborhood, and most importantly, offers a fun, welcoming ambiance and consistently good food/service. In all honesty, as much as I enjoy dining here I wasn’t planning on writing another post, but I felt it was my duty to share one particular dish with you…think of the rest as a bonus. Here they are up close and personal. Why? Because they deserve to be. 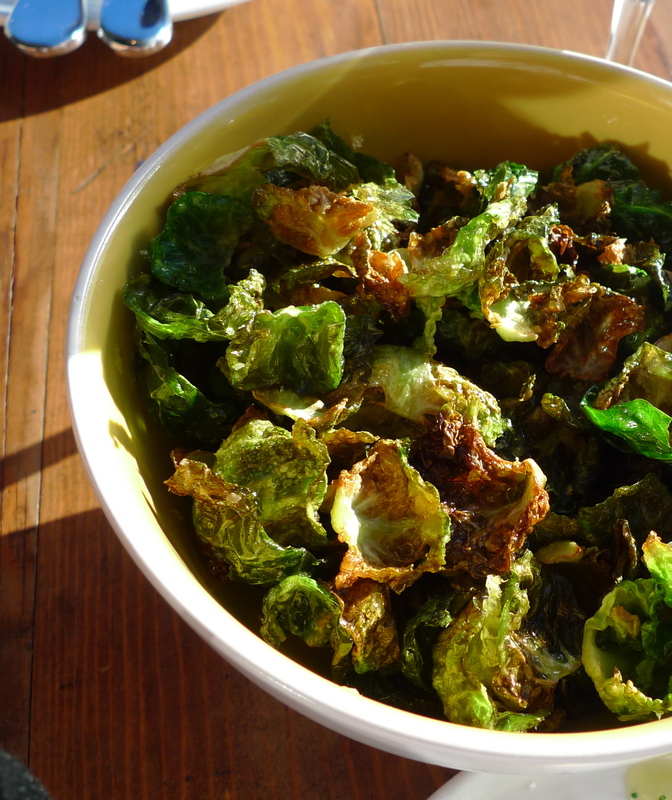 I’m not sure WHO peels each tiny brussel sprout leaf…to then fry each and every leaf so perfectly! That must be so laborious. All I can say is thank you from the bottom of my heart. I can nosh on these…forever. 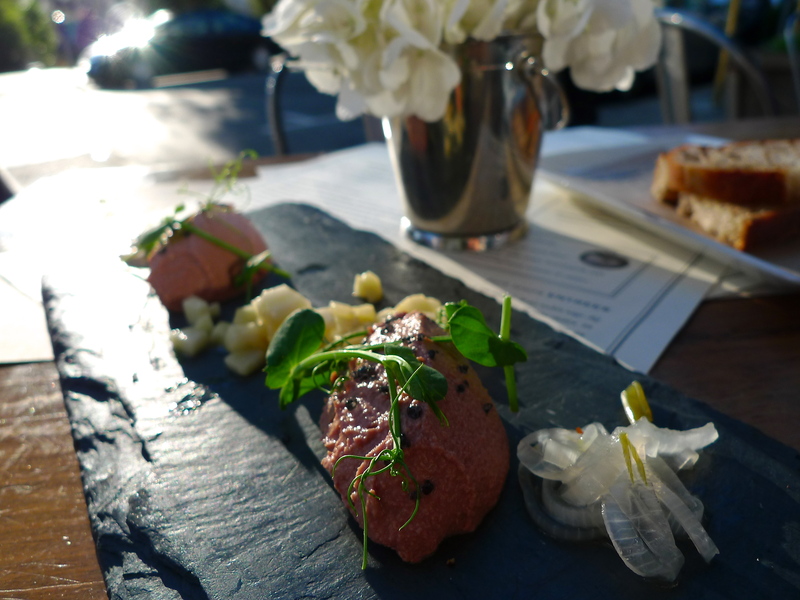 Duck Liver Mousse, Gravenstein apples and country bread. It is exactly as it seems – rich, delicious, heart stopping goodness. Squash blossom with spicy tomato confit and aïoli. 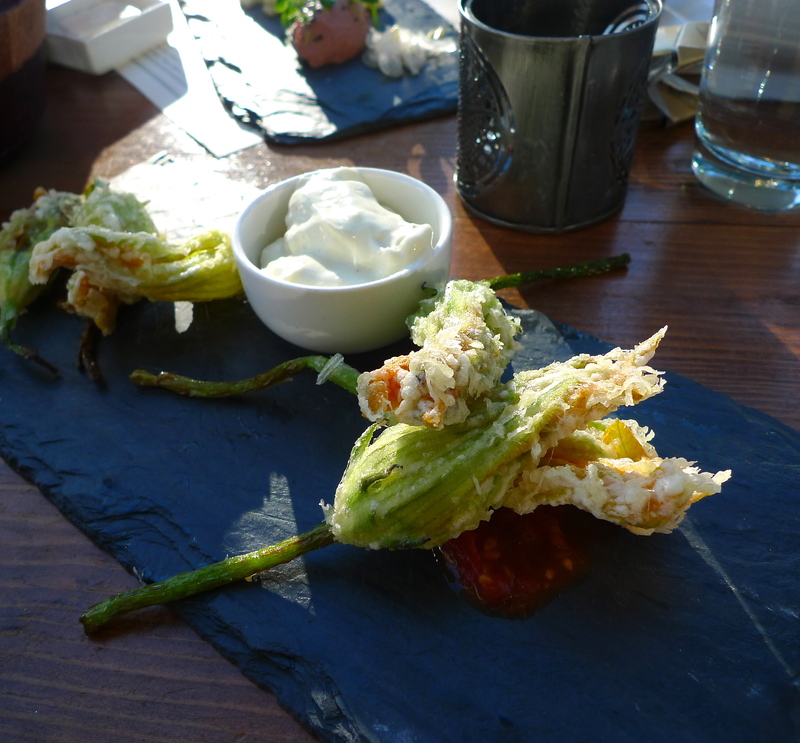 Mm, fried squash blossoms. I enjoyed the fact that they are not filled with anything. So it’s rather light (for being fried), not greasy and you really taste the squash blossom. The creamy aïoli and spicy tomato confit completes the picture. 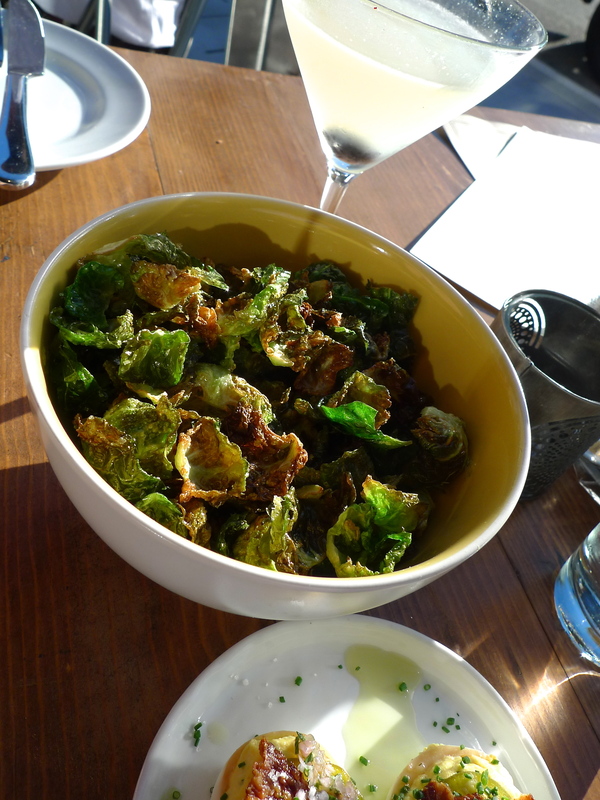 Besides being tasty, it’s also really pretty…which also describes sitting outside on a cool, yet sunny San Francisco evening, enjoying drinks, good company and appetizers at Park Tavern. Posted by aconsciousappetite in Food, I Seafood, Restaurants, Where's The Beef? I’m so happy to say that I got to share this meal with my best friend who was in town last Friday. He who shall be known as “BFF” (the post title, as intended, is giving him a good chuckle). Bff lives in Southern California and we don’t get to see each other nearly as often as we’d like, so it was fortuitous that he was in San Francisco for business while I was here as well. We spent our short time together at Park Tavern restaurant in North Beach. Lucky for us, we got the last table outside with a view of Washington Square. Our SF fog had not rolled in for the evening and the heating lamps also aided in our comfort while we chatted away. 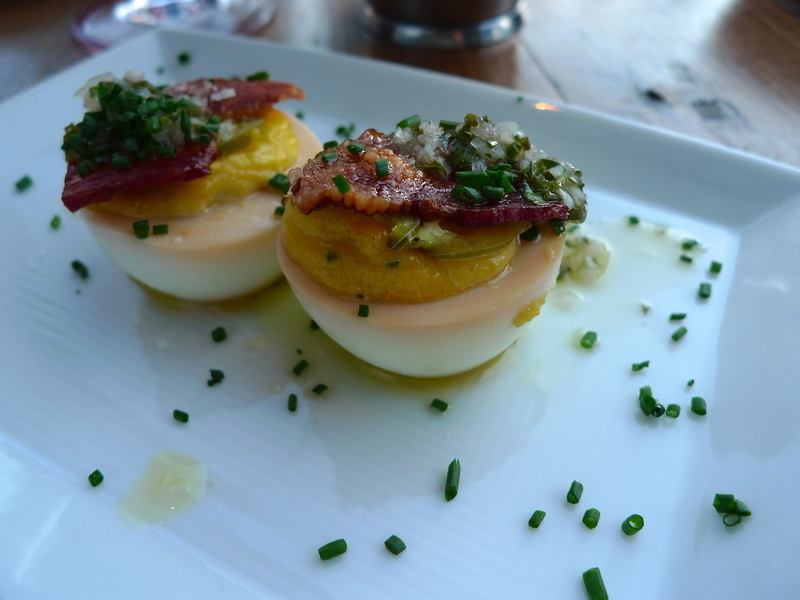 Deviled egg, bacon, pickled jalapeño and chive. I’m not usually a fan of deviled eggs, but these are an exception. What an appetizing way to start a meal. 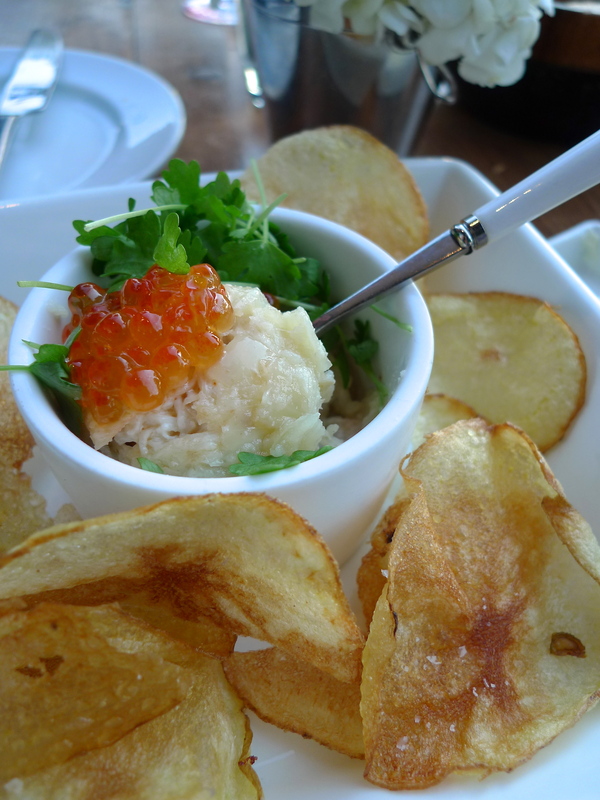 Dungeness crab dip, salmon roe and yukon gold chips. Mm, sweet succulent dungeness crab, salty roe and crunchy chips. It was a sublime combination. 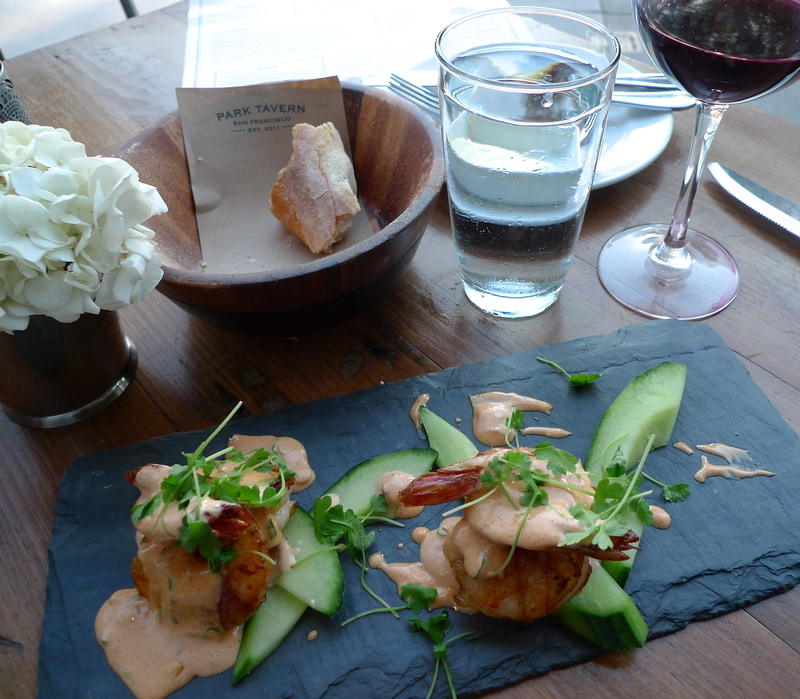 “Demons on Horseback” smoked lardo-wrapped prawns, scallion remoulade and celery leaf. Well cooked and seasoned with the cucumbers as a refreshing base. “Marlowe” burger, caramelized onion, cheddar, bacon, horseradish aïoli and french fries. Unfortunately, the burger was a disappointment. Not sure if they were having an off day, but both the bun and the burger were a bit dry. 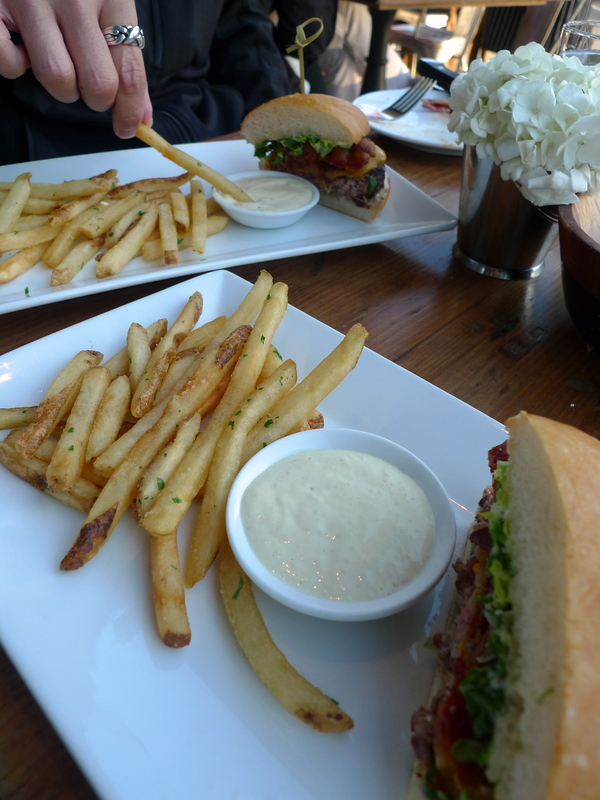 But, the fries were stellar as usual and the horseradish aïoli was a nice change from ketchup. Belatedly, it was at this point of our meal that I noticed that there was bacon in 3 out of our 4 courses?! I never thought I’d say this, but too much of a good thing can be too much! I don’t know what we were thinking, I guess our gabbing got in the way of our ordering. In any case, what a lovely place to spend time with bff. Park Tavern is a marvelous restaurant with exceptional service and ambiance.